Pura Vida! You can’t visit Costa Rica without hearing Pura Vida at least a few dozen times. The term has multiple meanings and can be used in place of a hello, goodbye, enjoy, or all the best for example, but for me, it epitomised the energy and friendliness of the Costa Rican experience. One thing is for sure in Costa Rica; you’re guaranteed to get an adrenaline kick in this beautiful Central American country. 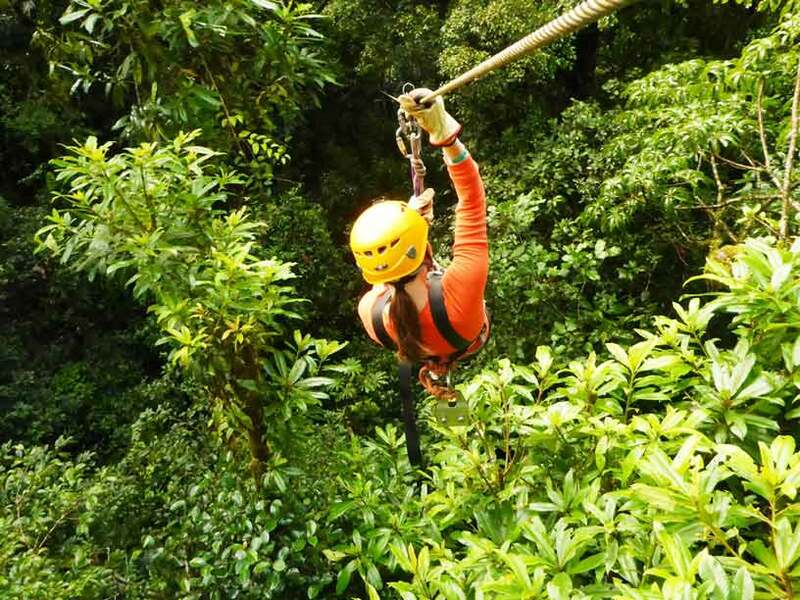 Costa Rica is a favorite playground for North Americans, offering a number of adrenaline activities ranging from bungee jumping to ziplining. The country is a lot better off than other Central American nations and has prices to match, so be prepared to part with some cash to have some fun though. But you’re on holidays right, so it’s all worth it. One of the activities that enticed me to Costa Rica was ziplining in Monteverde – and it was even better than I expected. There’s a number of operators offering ziplining, but the company I did it with was 100% Adventura. 100% Adventura offers a very professional and extensive set up and you’ll be sure to leave with a big grin on your face after a fun couple of hours. Before you get on the course, you’ll be led through a short information session on how to brake on the zip line using your gloves, and safety advice. Then you’re heading up into the trees to make your way through the course. The first section is a series of short zip lines that steadily get faster and faster. Then there’s the one where you don’t need even to brake yourself as the zip line itself has a brake. Then it starts to get really fun as you are hooked up to the superman ziplines – yes, it’s as it sounds – you’re lying on your stomach – and gliding along and it feels like you’re flying. There are two superman ziplines spanning 1600 metres nearly 130 metres above the forest – the longest zip line in Latin America. You’ll glide over treetops, houses and clouds before you hit a brake and come to a stop. Then you head to the tarzan swing – exactly as it sounds. You’re on a platform holding onto a rope and then dropped into a stomach in your throat freefall before swinging back and forth a couple of times. It’s scary for the first few seconds, then it becomes fun as you soar above the ground. The cost of the ziplining was $US45 ($A63), but it was well worth the money. There were 21 platforms all up, and you were on the zip line course for about two hours. Be sure to put this activity on your bucket list. 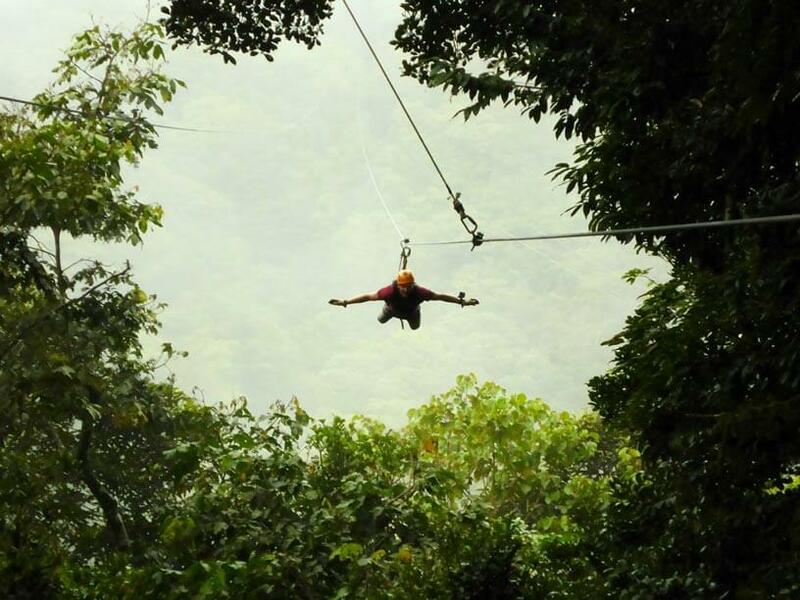 There is also zip lining offered by Selvatura Park, in the Monteverde Cloud Forest. The Selvatura Park zip line course provides 15 cables and 18 viewing platforms and also includes a Tarzan swing. Cloud forests are highland forests with 100% humidity. Due to all that humidity, cloud forests are home to hundreds of animal species including birds, insects and mammals such as monkeys and sloths. It seems a bit surreal as you drive up to the Monteverde Cloud Forest – one minute there’s blue sky and warm sun, and then you're surrounded by mist as you go into the clouds. 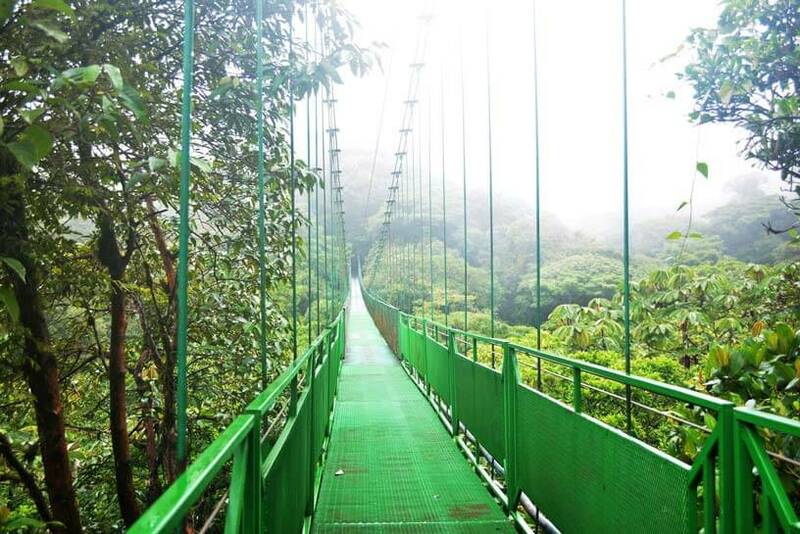 To immerse yourself in the cloud forest, visit the Selvatura Park Treetop Walkway. The Treetop Walkway consists of eight suspension bridges, forming a 3km trail through and above the treetops. The bridges vary in length from 50 m to 170 m and are suspended from heights ranging from 12 m to 60 m above the ground. If you’re lucky and keep a sharp eye out, you might spot some of the many animals living in the cloud forest. Depending on your pace and photo stops, the trail will take around an hour to complete. Selvatura Park offers a free shuttle to and from downtown Monteverde. Entry to the Hanging Bridges Walk is $30 ($A42). Make sure you bring a rain jacket and enclosed shoes when visiting the cloud forest. Selvatura Park also offers a butterfly garden, hummingbird garden, Serpentarium and insect exhibit. If you’re keen to see the animals of Costa Rica, take part in a night walk. Some operators in Monteverde offer the night walk, where you’re likely to see sloths, bats and tarantulas. The night walk runs for about 90 minutes. Expect to pay around $US25 ($A35). Other activities offered in Monteverde are horseriding and all-terrain vehicle (ATV) tours through the local area. The scenery along the way includes coffee and banana plantations. Got bungee jumping on your bucket list? Then Monteverde might be the place to tick it off. I never thought I would be brave enough to go bungee jumping (that whole head first thing scared me), but I tackled my fear and did it. I took the plunge with Extremo Monteverde. 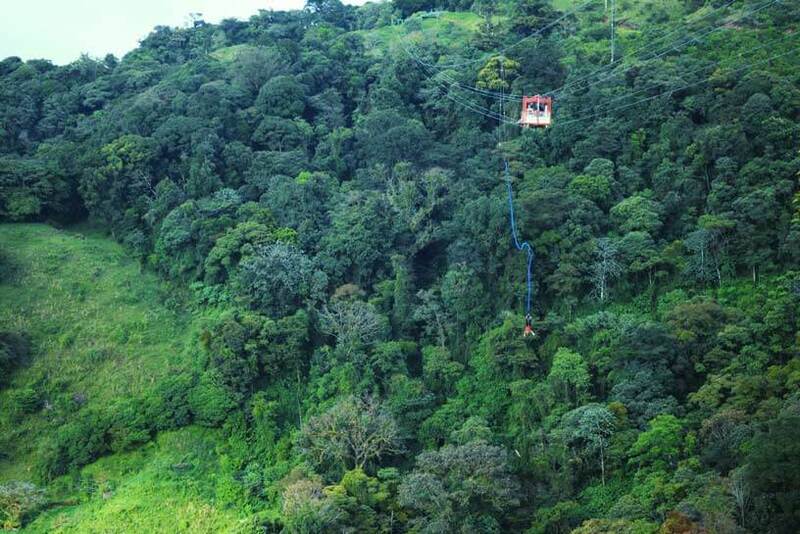 The jump is from a cable car suspended 150 metre above the trees and it is the highest bungee jump in Central America. You’re taken out in the cable car in groups of three with two instructors. The bungee cord is attached to your ankles, you’re counted down from five, and then you dive head first. It all went pretty quick, I dived as soon as the operators counted down to one, then realised I was in a freefall, and then a second later I snapped back on the bungee. I bounced a couple of times, then after a couple of attempts, caught a carabiner on a rope and attached it to my harness, and got pulled back up to the cable car. Catching the carabiner was probably the most challenging part as you bob upside down a hundred metres from the ground! The cost of the bungee jump was $US60 ($AU84) – still a lot cheaper than many other places around the world offering bungee jumping but Extremo was a very professional and friendly operation. Extremo also offers zip lining from its Monteverde premises. After all those adrenaline highs, you’re probably feeling hungry. 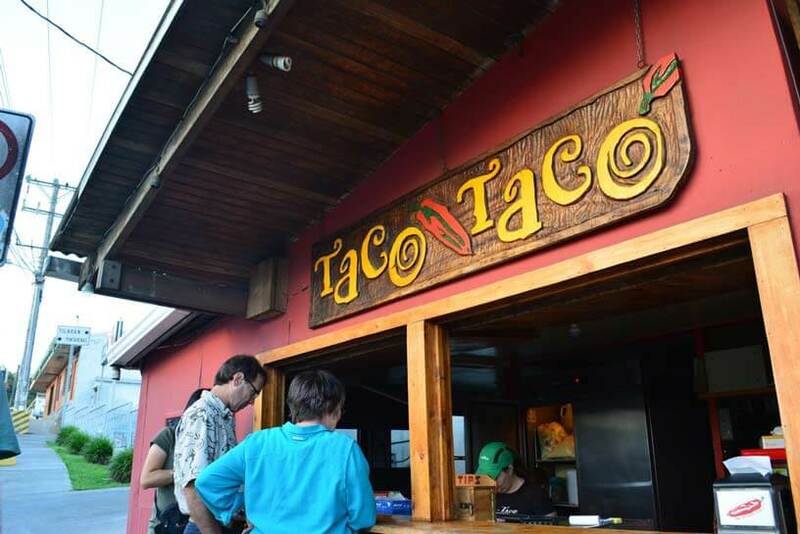 Taco Taco in the Monteverde centre will hit the spot with a number of Mexican style options such as tacos and burritos starting at around $AU8. For a drink, Bar Amigos is popular with locals and tourists and there’s live music some nights, expect to pay a cover charge of around $AU13 on the weekend.